[03/03/2016 @ 10:11 PM] Book this flight on: Google Flights, Priceline, Travelocity, Orbitz, CheapTickets, Expedia, Hotwire, BookingBuddy. [03/04/2016 @ 11:27 AM] Delta is now matching. [03/04/2016 @ 8:42 PM] American is now matching. [03/06/2016 @ 7:20 PM] Mostly sold out. [03/07/2016 @ 8:24 AM] Fare gone. Removing from deal list. 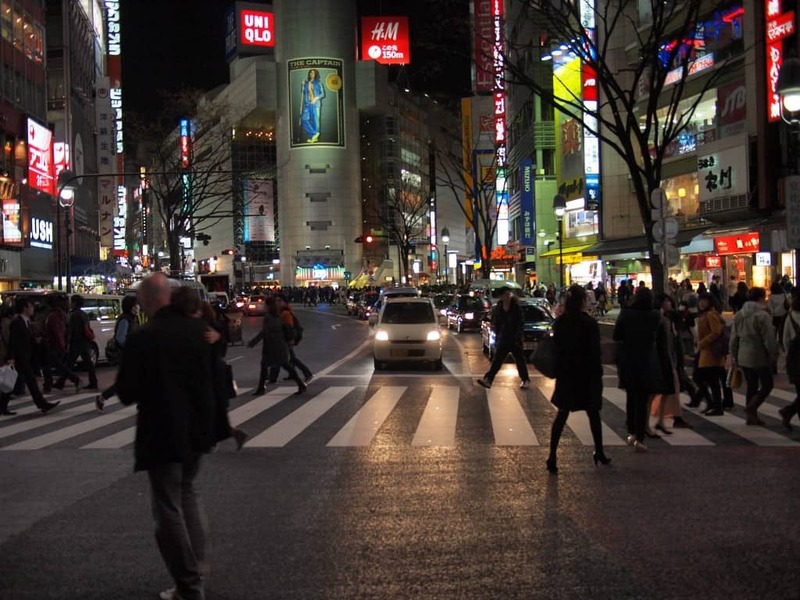 United and American Airlines have round-trip flights from Houston (IAH) to Tokyo (NRT) for $602 with a connection. Cheapest flights are midweek from April to early-May. For United flights, you must re-direct to United’s website from Google Flights, it is not available directly on any OTA or United’s website. For AA flights, you can book it on most websites normally. Use Google Flights to price the ticket. Select midweek dates in April to early-May. On Google Flights, select Chicago (ORD) as the connecting airport. Select flights that have a connection in Chicago that is at least 2-hours long. Do not select NONSTOP flights. Redirect to United from Google Flights. 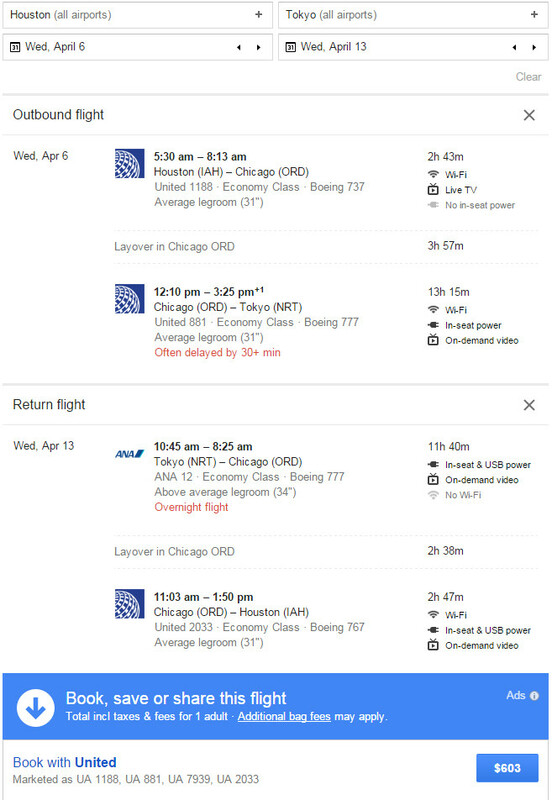 Example Dates: United (Google Flights) Apr 06 – Apr 13 / Apr 06 – Apr 20 / Apr 13 – Apr 20 / Apr 12 – Apr 19 / Apr 19 – May 03 / May 04 – May 11 / Other dates: Use Google Flights, and follow the instructions above. Example Dates: Delta / American (Priceline / Travelocity) Apr 14 – Apr 21 / Apr 19 – Apr 26 / Other dates: Use the +/- 3-day search tool on CheapTickets. This deal has already been matched by AA and it may eventually get matched by other airlines. Before you finalize your purchase, use BookingBuddy to see if any other website or airline is offering a better deal on the dates you selected. I was able to pull this up on Google Flights which then allowed a re-direct to United’s website to book. Screenshot taken at 10:38 PM on 3/03/16. Prices and availability can and will eventually change. Note: OTAs such as Orbitz and Priceline allow free cancellation without penalty before 10 PM central time the day after you purchase. As deals sell-out or expire quickly, this policy will allow you to “lock-in” the cheap fare while you sort out a plan. Just keep in mind that after 10 PM the next day, you will not be able to cancel without the regular penalty. On Orbitz, you can easily see if your ticket allows a free cancellation, just look for “FREE Cancel” next to the price of the ticket. Availability: It’s kind of glitchy. Book this flight on: Google Flights, Priceline, Travelocity, Orbitz, CheapTickets, Expedia, Hotwire, BookingBuddy.